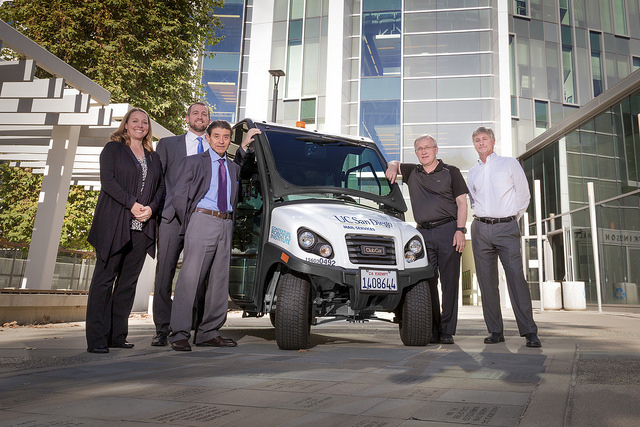 UC San Diego is becoming a test bed for self-driving vehicle technology. With a campus that encompasses more than 3.3 square miles and a daytime population of roughly 65,000, “It’s a small city,” said Henrik Christensen, who is leading the new project as director of the university’s Institute for Contextual Robotics. Christensen, who announced the move Friday at a robotics forum entitled “Intelligent Vehicles 2025,” said the effort would enable UC San Diego scientists to help solve the kind of problems autonomous vehicles will likely encounter along crowded streets. On the UC San Diego campus, that includes fast-moving skateboarders and students who pay little attention when they’re crossing streets. The project, set to begin in January, will start off with two self-driving mail delivery carts equipped with technology and driven by algorithms developed by researchers at the Contextual Robotics Institute, Christensen said. Back-up drivers will initially ride along as a safety measure. As it turns out, the San Diego region was named earlier this year by the U.S. Department of Transportation as one of 10 “proving grounds” for testing self-driving vehicles. Beginning in January, companies developing self-driving technologies will be able to test-drive their autonomous vehicles along a segment of Interstate 15, a toll road on State Route 125, and on certain city streets in Chula Vista, CA. “Operationally, we need to understand what the rise of intelligent vehicles is going to require,” said Peter Thompson, a senior transportation technology analyst with the San Diego Association of Governments, a regional planning agency overseeing the autonomous proving grounds. The DOT list of proving grounds also includes the American Center for Mobility at Willow Run, a nonprofit testing center in Ypsilanti, MI; the Bay Area’s Contra Costa Transportation Authority and GoMentum Station; The Texas Autonomous Vehicle Proving Ground at Texas A&M in College Station, TX; and the University of Wisconsin at Madison. Of course, varying levels of self-driving vehicles developed by tech companies like Google, Tesla, and Uber have been driving along California roads and highways for years. There was a moment of confusion. Software bugs? 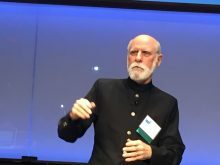 “We have encountered a lot of bugs on our cameras,” he explained, and the bugs’ residue on the camera lenses was interfering with the machine vision of their self-driving car.